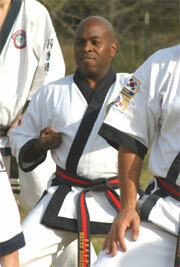 My martial arts training originally started at Cho’s Tae Kwon Do right here in Houston, Texas at age 10 in 1982. While I only trained for a few months, the interest had definitely sparked. In the next years, I got involved in such sports as swimming and even competitive wrestling & gymnastics at the high school level. During my freshman year at University of Houston, I discovered a Shotokan Karate club on campus and plunged himself into training again. Unfortunately, a move to the Maryland area uprooted my training once again, until I was able to find another local school that specialized in that same style. I found that school by training under Master Don Covington, who specialized in both Shotokan Karate and Aikido as well. Still, my journey was not complete and I once again moved, landing in Baton Rouge Louisiana. Once in Baton Rouge, the desire to train in martial arts had firmly taken hold; and after an exhausting search for a good traditional school, I met Kyo Sa Nim Dale McKey, who taught Traditional Tang Soo Do class out of a local fitness center. Soon after, starting, I met Grandmaster CS Kim of the International Tang Soo Do Federation (ITF), and I have been training in Tang Soo Do ever since. In 2004, I opened up a school at a local YMCA in Baton Rouge to provide martial arts training to inner city school kids. I found this to be an extremely rewarding experience, and had amassed about 30 students before my career in the marine industry moved me back home to Houston in December of 2007. After 14 years of study, in October of 2007, I tested for the rank of 4 th degree master at Federation headquarters in Pittsburgh, PA. I was promoted to the rank in 2008. I am still a very active member of the International Tang Soo Do Federation; and I recertify for my rank every year until I am eligible to test again. The federation has enabled all kinds of opportunities to train with other Tang Soo Do instructors and masters all over the world, including Mexico, Germany, Panama and various parts of our great country as well! In addition, I have worked as a bouncer in night club security, taught self defense to juvenile dentition officers, and host workshops on self defense as often as I can. I feel that has enhanced my abilities as both a martial artist and an instructor as well, giving me practical experience to go with all the traditional training. Keep in mind, the experience I’ve gained in competition has been an excellent way to gauge my abilities; but the focus of my Tang Soo Do training is not to compete. The study of Tang Soo Do is a journey of self discovery through traditional martial arts where one gains peace of mind and spirit through the discipline that comes with training and the ability to defend one’s self at Innate Chiropractic Healing Arts Center. Those that train with me join me on that journey and experience how martial arts can positively affect everything we do!